Soluble in acetone, alcohol, and dilute aqueous alkali. Soluble in water. Rose bengal is a stain with a pink color. Its disodium salt form is commonly available in eye drops as a diagnostic agent when there is suspected damage to conjunctival and corneal cells. 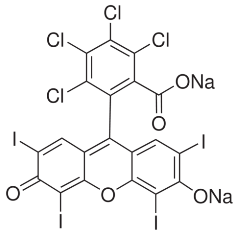 It is also used in laboratory settings, including the preparation of Foraminifera for microscopic analysis and suppression of bacterial growth in several microbiological media [Wikipedia]. The clinical applications of rose bengal as injectable formulation under the name PV-10 in melanoma, breast cancer and skin conditions such as eczema and psoriasis are being investigated in clinical trials. ROSE BENGAL is a bright bluish pink compound that has been used as a dye, biological stain, and diagnostic aid. Rose bengal has been used to aid in the diagnosis of preocular tear film disorders, mucin preocular film deficiencies, and superficial corneal epithelial abnormalities in horses. Rose bengal stains dead and degenerating cells and mucus. However, rose bengal has a dose-dependent ability to stain normal cells, and this ability is normally blocked by tear film components.Therefore stain uptake may indicate tear film abnormalities, such as a mucin deficiency, more accurately than cell viability. Rose bengal is available both as an impregnated paper strip and a solution. Use of the 0.5% or lower concentrations can minimize the irritation that can be associated with the 1% solution. The dye has also been shown to be toxic to corneal epithelium at routine concentrations. Slit-lamp biomicroscopy may be necessary for adequate visualization of rose bengal stain.